Across Canada, Telus has overtaken Bell for download speeds according to Tutela's latest crowdsourced results from December. Bell managed to retain the lead in Ontario, and Freedom Mobile continues to perform well in British Columbia, with the best average results for upload speeds and latency. 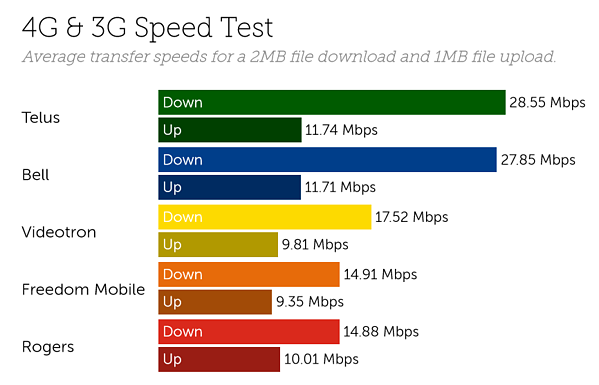 Telus leads overall download speeds across both 3G and 4G with average results from December of 28.55 Mbps, based on approximately 118,000 download tests. Average results on the Bell network aren’t far behind, reaching 27.85 Mbps, ahead of Videotron, Freedom Mobile and Rogers respectively. 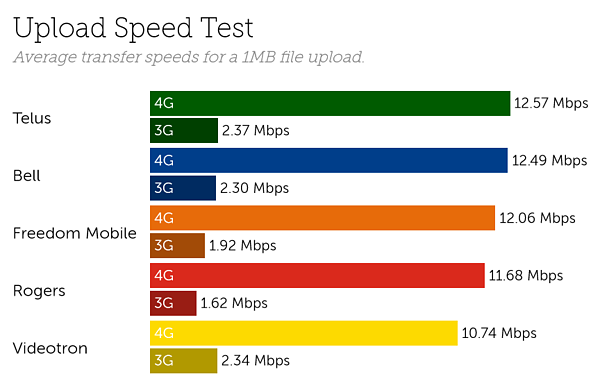 Our results show a similar pattern when we split 3G and 4G tests, with Telus just inching ahead of Bell, averaging 30.90 Mbps and 30.01 Mbps on 4G respectively. With average speeds of 12.57 Mbps on 4G, Telus also performs best across Canada for upload speeds. Bell places second with average speeds of 12.49 Mbps, followed by Freedom, with 12.06 Mbps, Rogers, with 11.68 Mbps and Videotron, with 10.74 Mbps. Upload speed results are similar across the territories, except for in British Columbia, where Freedom Mobile performs best, averaging 13.11 Mbps on 4G. Average results for latency across all the operators in Canada were close in December, with Videotron performing best on 4G and 3G. Its 4G results averaged 15.9 ms, followed by Freedom Mobile, Telus, Bell, and Rogers - which averaged 22.7 ms across the country. Similarly to upload speeds, Freedom Mobile also perform best for latency in British Columbia, averaging results of 14.9 ms on 4G. 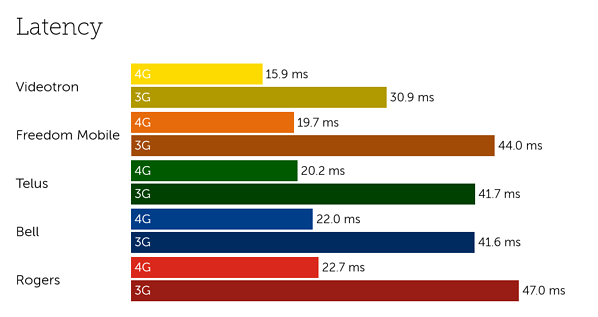 Our findings for the Canada are based on 15.4 billion network quality measurements including 5.21 million speed tests in December 2018. Our latest complimentary Mobile Experience Report is available to download from the Tutela Insights portal.